Augustus Sol Invictus, a 32-year-old lawyer, is running to replace Marco Rubio in the U.S. Senate. In recent days, he’s had to convince his voter base that the fact he once sacrificed a goat and drank its blood shouldn’t sway them against him. He’s also had to deny allegations that he’s a neo-Nazi or that he wants to start a race war. Just another beautiful and very average day in Florida politics! Invictus is locked in a war of words with Adrian Wyllie, the former chairman of the Libertarian Party of Florida and a one-time candidate for Governor. Wyllie resigned his post in protest of Invictus’ Senate campaign, despite the fact that Invictus is currently the only Libertarian running. He has described himself as an American Fascist, and even his campaign logo is nearly identical to that of Benito Mussolini. He has displayed swastikas in his published campaign materials. 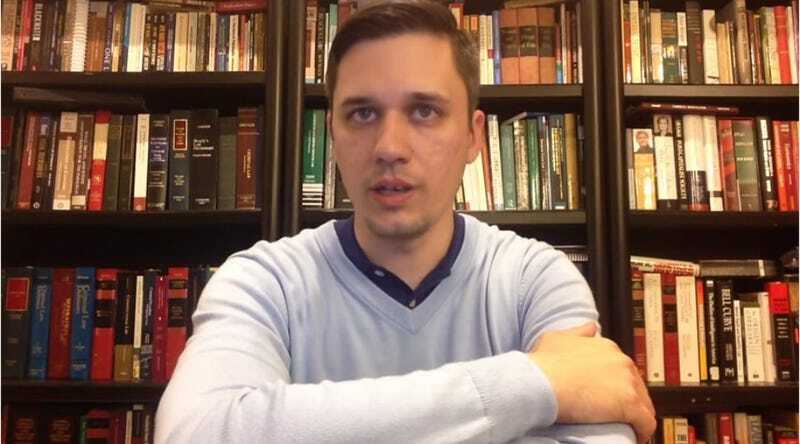 Many of his supporters are known members of Neo-Nazi and white supremacist groups, such as American Front, Vinelanders, and Stormfront, and he has been recruiting them into the Libertarian Party. Mr. Invictus practices Thelema, an occult pagan religion based on the teachings of Aleister Crowley. Mr. Invictus was ejected from Ordo Templi Orientis for brutally and sadistically dismembering a goat in a ritualistic sacrifice. It has been said that I am a racist and a neo-Nazi. I guarantee you that my Puerto Rican ex-wife, our half-Puerto Rican children, and my half-Colombian step-children—not to mention my string of Latina girlfriends—would be quite shocked to hear of this. It has been said that I have promoted a “race-based civil war.” I will give one million dollars to the person who finds this in anything I have ever said or written. The candidate has also come in from some questioning about his accent, which seems to only appear when he’s giving speeches. Though he doesn’t have any discernible accent normally, when addressing the public, he sounds heavily Southern. Colonel Sanders or Foghorn Leghorn Southern, one might describe it. Invictus told Capital New York the change is a result of nerves and adrenaline. Instead, by December 2014 he was representing Marcus Faella, formerly of the American Front, a white supermacist group. Ten Florida members, including Faella, the American Front’s then-leader, were arrested in 2012, accused of plotting to kill Jews, non-white people and immigrants. Faella was eventually convicted on the lesser charge of teaching paramilitary training in preparation for a future race war. He was sentenced to just six months in jail, which he appealed, with Invictus as his lawer. Jezebel has contacted Invictus for comment and will certainly update if we hear back.